No. 1.—A new style of Head-Dress. Worked in the second size crimson chenille, with No. 4 gold thread. Take a card-board of three inches deep and fifteen inches long, and fasten to the edge of it eleven strands of chenille and gold thread placed together; leave a space of one inch between each strand; the length of the gold and chenille thread must be twenty-four inches. 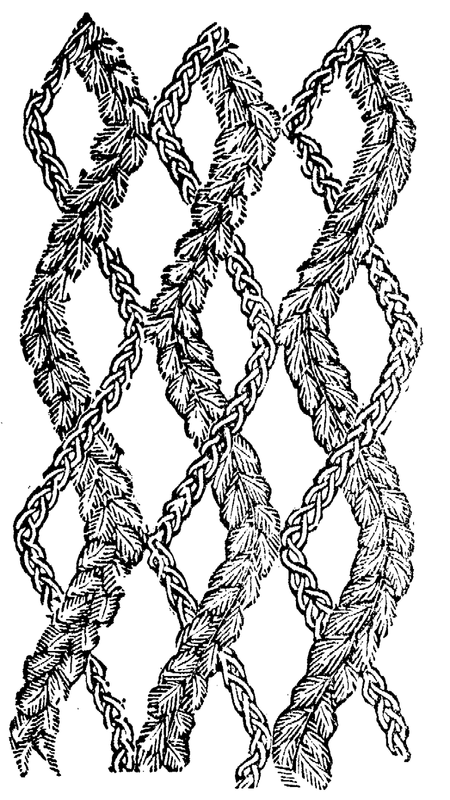 Take the first two threads from the left-hand side, pass the two next under them; tie them in a knot, the two outer over the two centre threads (chenille or gold thread, as may be), and then pass them through the loop formed on the left, and so on till the last row. The shape is an uneven triangle, nine inches from the top corner to the centre, and seven inches from the middle of the front to the centre. When finished, cut off the board, and sew round two sides of the work a fringe of gold thread, which is to fall over the neck. No. 2.—Another style of Head-Dress. With white and pink second size chenille. This is made nearly in the same manner as No. 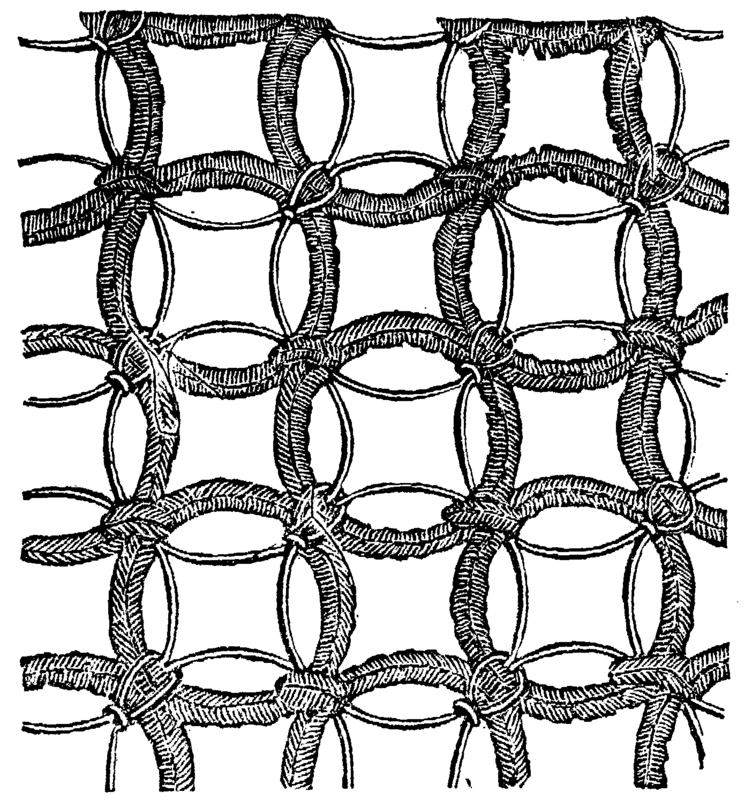 1, with chenille, one yard long; but, after having made the first knot, pass a pearl bead on each side, and then make the second knot—the measurement of the meshes to be three-quarters of an inch. When the work is finished, the whole will be twelve inches square. 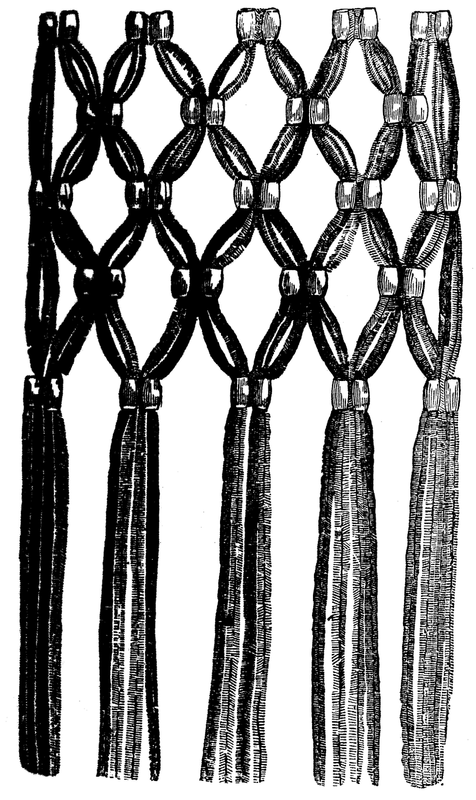 Pass round it an India-rubber cord, which will form the fastening. 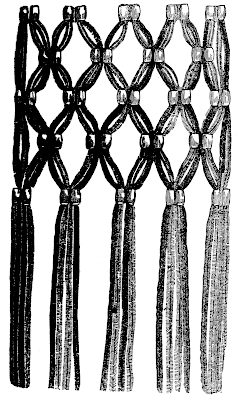 The ends left from the work to be separately knotted together with silver thread, to hang down, forming a very large and rich tassel. No. 3.—Head-Dress of blue and silver. 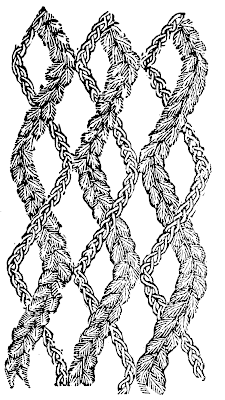 In chain crochet, silver cord No. 5, with second size of crochet chenille, light blue. Eight chain stitches, the last of which is plain crochet, and so on continued. 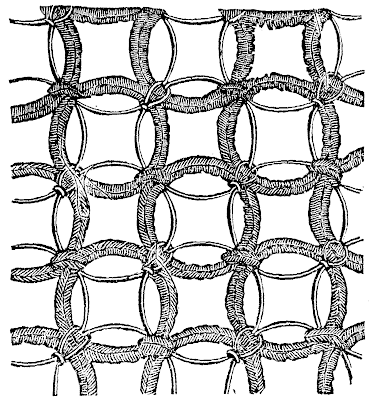 In the two middle stitches of the chenille take up the silver, and in the middle stitches of the silver take up the chenille, each going in a slanting way, once over and once under each other, as the drawing (No. 3) will show. The chenille is worked one way, and the silver goes the other way, contrary to regular crochet work. The whole is worked square, eighteen inches in square; and, when finished, every loop is taken up with fine India-rubber cord, to form the shape. Put round it a silver fringe one inch and a half deep. oj, vad du kan! Får kanske börja gå till frissan - senast var nog i Helsingfors i januari 1968! I min ungdom försökte jag göra olika hårnät, men mitt babyhår fyller inte ut ett nät utan valkar och toupering - så jag slutade snart. 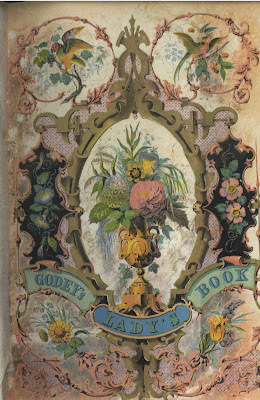 I have a young friend who loves the Godey's books. She makes things from them all the time that are very old-fashoined and charming. There are only two of them at Gutenberg - but after looking through them, I can see why she is in love whith them.